Most radiographic images that are used to place implants were two dimensional. Properly angulated, they provided a reasonable estimate of bone height. Often bone width was not determined until the bone was exposed during surgery. This often led to surprises for the implant surgeon. Inadequate width could result in the compromised placement of the implant. This results in implants being placed in bone that later can not be restored be the restoring doctor. In order to better control the late discovery of inadequate bone structures, cross sectional images are required. They are now quickly becoming the standard level of care. There are only two ways to acquire these images. The first method uses Tomography. The amount of radiation is mild compared to a CT scan. Tomograms result in a 60-70 magnification and are accurate about 60 percent of the time. The second technique involves the use of Computed Tomography Studies (CT Scans). This allows a very detailed assessment in three dimensions. 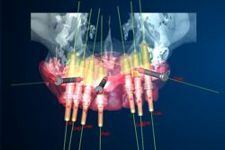 These 3-D visualizations coupled with the appropriate software allow implants to be placed with a level of precision that was unattainable several years ago. In addition, the surgical procedures can often be accomplished in a much more conservative procedure which involves greatly reduced discomfort, less treatment time and a more accurate final outcome. Currently there are two companies that have developed virtual modeling software. Materialise developed SimPlant computer guided implantology software. The adjacent photo is a generalized representation of SimPlant technology. Nobel Biocare developed the NobelGuide concept using Procera software. The adjacent photo is a specific representation of Nobel BioCare technology for a particular treatment plan. SimPlant requires the radiologist to purchase software that converts the Computer Tomography studies into data that is recognized by the reformatted CT images SimPlant software. Therefore, the patient must have access to such a facility. This software is expensive and requires the radiologist to have training. During the scan the patient must wear a scan prosthesis which will indicate the position of the teeth and gums on the SimPlant study. This device is fabricated prior to the scan. Missing teeth need to be placed in the proper position on the model so that they appear on the SimPlant study. SimPlant has a library which contains the virtual implants from all major manufacturers. Initially the areas where implants are to be placed are analyzed to determine the volume of bone, location of vital structure (nerves, blood vessels, and sinus cavities) the quality (density) of the bone can also be measured. After the vital structures are identified and the implants placed a surgical guide can be ordered. There are three types of SurgiGuides: tooth supported, gum supported and bone supported. Recently, Materialise has introduced their �Safe System.� This limits the depth as well as the entry position. The drills are not internally irrigated and there is a large gap between sizes. This could result in overheating the bone which results in osteonecrosis and implant failure. In theory, this system can be used with any cylindrical implant system. NobelGuide designed only to work with their products (i.e., proprietary). SimPlant is not as proprietary - other cylindrical implants can be used in a similar fashion with SimPlant. Internally irrigated drills are available. Smaller gap between drill sizes. Higher accuracy. Scan bcan be done at any imaging facility. Existing denture can be easily modified for scanning. When immediately loading implants it is critical that there is a passive fit to avoid broken or loose screws, pressure necrosis on the implant, or a fractured metal substructure. Initially expensive, NobleGuide system has adjustable abutments that allow 500 microns of vertical movement. The drill guides work to within 200 microns so there should be more than enough to compensate for slight variation due to tissue compression of laboratory and surgical variance. The NobelGuide concept is very proprietary, no volume calculations for grafting procedures, however it is the only true complete system available on the market today. The SimPLant and Nobel Biocare technology solutions each have their benefits and drawbacks depending on the need of the patient.